The Washington Nationals landed one of the top prizes on the free-agent market by signing left-hander Patrick Corbin to a six-year, $140 million deal, according to multiple reports Tuesday. Corbin also visited with the Philadelphia Phillies and New York Yankees during the process before opting to join a starting staff that includes three-time Cy Young Award winner Max Scherzer and former No. 1 overall pick Stephen Strasburg. The 29-year-old Corbin still must pass a physical for the deal to become official. 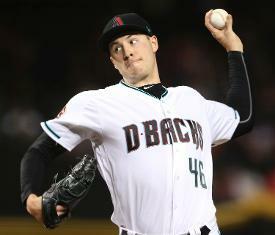 Corbin went 11-7 with a 3.15 ERA during an All-Star campaign for the Arizona Diamondbacks last season. He set a career high for strikeouts with 246 and reached 200 innings for the second time in his career. Corbin also was an All-Star in 2013 when he went 14-8 with a 3.41 ERA. He injured his pitching arm in Spring Training the following season and underwent Tommy John surgery. Corbin missed all of 2014 and half of the 2015 season. Corbin struggled in 2016 -- he went 5-13 with a 5.15 ERA -- before bouncing back to match his career highs for wins in 2017. He went 14-13 with a 4.03 ERA that season. Overall, Corbin is 56-54 with a 3.91 ERA in 172 career appearances (154 starts). The Nationals appear unlikely to sign their own free agent in outfielder Bryce Harper.